The Mystery at Port Greely is an adventure for Astonishing Swordsmen & Sorcerers of Hyperborea, the Old School Renaissance emulation of Advanced Dungeons & Dragons that mixes ‘Swords, Sorcery, and Weird Fantasy’ published by North Wind Adventures. It is designed for four to six players of between Fourth Level and Sixth Level. Set in the game’s default world of Hyperborea, concerns the fate of a group of emissaries sent by the Fishmonger’s Guild in City-State of Khromarium to the vassal town of Port Greely. The Greely lobstermen have grown increasingly isolated and recalcitrant over the past three years, but they still paid their taxes, so this was never an issue for the City-State of Khromarium. Yet those emissaries have been missing for two weeks and the good guildsmen of the Fishmonger’s Guild are concerned and want answers. Thus they hire the player characters to sail to Port Greely, even providing passage, to search the coastal town for their emissaries and establish their former good relationship with the Port Greely lobstermen. Published following a successful Kickstarter campaign, is not so much Lovecraftian influenced scenario for a Dungeons & Dragons-style retroclone, but rather a scenario directly based on the H.P. Lovecraft short story, ‘The Shadow Over Innsmouth’ for use with Astonishing Swordsmen & Sorcerers of Hyperborea and retroclones. Its influences are not so much worn on its sleeve as seep out from between every webbed finger or two, ooze from under every thick fold of skin around the neck, and gurgle out of every frog-like throat through newly acquired gills. This is a tale of monsters and miscegenation in a wretched hatchery of croaking horror and batrachian blight. So the player characters sail to Port Greely and find it a run down, mouldering town. What few inhabitants there on the streets are jaundiced, misshapen, lumpy figures with bulging throats and eyes, and rough, almost scaly skin, termed ‘townies’ in the scenario. They avoid the interloping adventurers and what little can be learned from them amounts to a distrust of men from decadent Khromarium and any further information can be learned from Merlokk, the town’s high priest and de facto leader. Much like the short story it is based upon, to learn anything more of The Mystery of Port Greely, the player characters must speak to the town drunk, Zephæstus. This may or not come after the player characters have been chased through the port and captured by townies who have slunk out of their homes to apprehend them. Clues as to what is going may be found in Port Greely’s most prominent landmark, the Fane of the Esoteric Order of Mother Hydra, but Zephæstus will point the player characters to the four islands of the Greely Shoals as the best place to get answers… Here lies the terrible Temple of the Deep Dwellers, home to the batrachian monsters who have their scaly claws on the future of Port Greely and also the climax to the scenario. In actuality, what The Mystery of Port Greely is not, is a scenario of Lovecraftian investigative horror, nor is it particularly Lovecraftian. 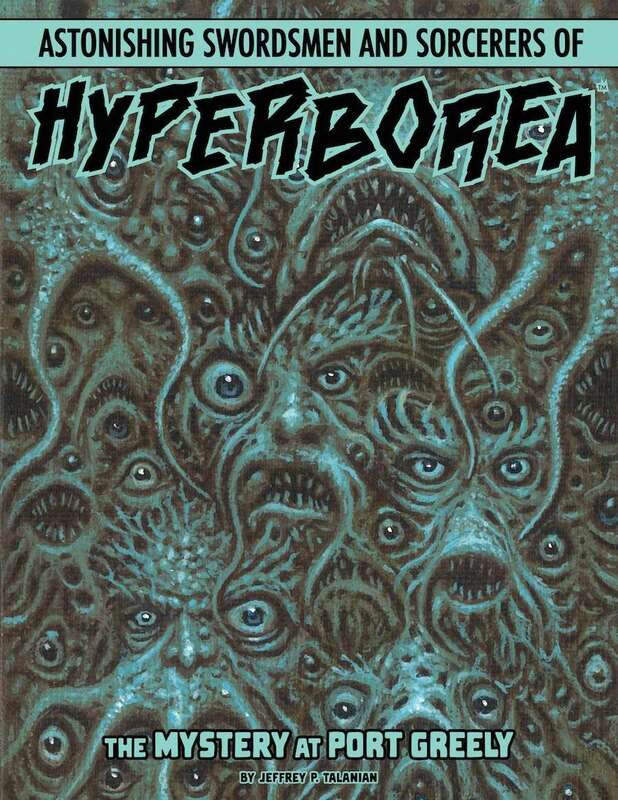 This is primarily because of what Astonishing Swordsmen & Sorcerers of Hyperborea emulates—Advanced Dungeons & Dragons—and those rules predated the introduction of a Sanity mechanic. 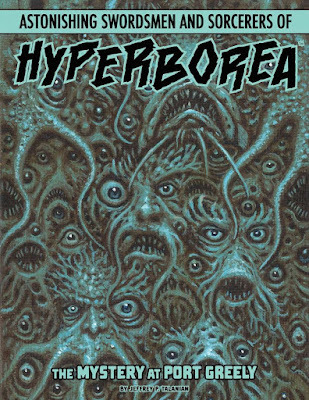 So there is no deleterious mental effect to seeing any of the monsters in The Mystery of Port Greely, just as indeed, there is no deleterious mental effect to seeing and fighting any of the monsters in Astonishing Swordsmen & Sorcerers of Hyperborea or Advanced Dungeons & Dragons. So whilst The Mystery of Port Greely has the trappings and themes of a Lovecraftian scenario—a viscous quality to a lot of the location descriptions, a sense of helplessness and hopelessness (at least in some of the NPCs if not the player characters), and miscegenation, but this has to be contrasted with the pulp fantasy, swords and sorcery setting of Astonishing Swordsmen & Sorcerers of Hyperborea with its lusty blood and carnage, civilisation against barbarism, and so on. After all, what the player characters will be doing is bringing the civilisation of the City-State of Khromarium to Port Greely and putting its barbarous and degenerate inhabitants to the sword and the spell. One issue with the plot of The Mystery of Port Greely is that the player characters are drugged whilst in the town. This really has no major effect upon the plot. Rather it serves to get the player characters to Zephæstus in one fashion or another, and there have their fears confirmed. It also sets up the major roleplaying scene in a scenario which is fairly light on interaction. Deep Ones—or Deep One-like creatures—have existed in Dungeons & Dragons for a very long time, whether it as the Sahuagin of U3 The Final Enemy or the Kua-Toa of D2 Shrine of the Kuo-Toa and D3 Vault of the Drow. In The Mystery at Port Greely, they are more obviously Deep Ones rather than just another evil amphibious species, for the scenario draws very obviously from ‘The Shadow Over Innsmouth’ for its inspiration. It does not ignore the fact that it is a Dungeons & Dragons-style adventure though and the origins of the threat faced in The Mystery of Port Greely is taken from Dungeons & Dragons, even if it is tinged by the Mythos. If the reliance on ‘The Shadow Over Innsmouth’ means that the plot of The Mystery of Port Greely is perhaps just a little simplistic, the adventure more than makes up for it with great art and great descriptions that impart the degeneration at its heart.